Nearly a year ago, Baristas Coffee Company, Inc. (BCCI), a fast growing U.S. based beverage and branded products company, announced they want to get off the Pink Sheets and on to a higher tier. On Wednesday, the Company announced that it has completed all requirements and that its application to receive a symbol to be traded on the NASDAQ Capital Market has been approved. 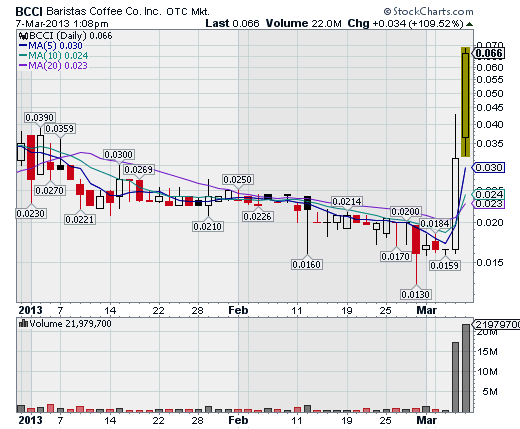 The symbol issued to Baristas Coffee Company is (NASDAQ:BAPI). Baristas will continue to trade under the symbol BCCI.PK throughout the application process and comment periods until such time as it completes its up listing and begins to trade on the NASDAQ Capital Markets at which time it will trade under the newly reserved symbol NASDAQ:BAPI. The companies that are listed on NASDAQ Capital Market need to satisfy all the required qualifications for NASDAQ securities in Rule 4300. The companies also need to adhere to the corporate governance standards set by NASDAQ. The Over-The-Counter Bulletin Board (OTCBB) is a part of the NASDAQ Capital Market and where AimHighProfits thinks Baristas Coffee is headed to, not the NASDAQ that everyone else thinks.